Our wedding was 9 months ago but I took a blog hiatus last year, so I wanted to do a quick post with some tips. Obviously different things work for different people and many factors go into how you plan your wedding, but I think there are some general suggestions that are helpful for everyone. Spreadsheets. They are your friend. Even if they aren’t very detailed I highly suggest a spreadsheet for various aspects of planning: comparing venues and/or vendors, budget, timelines, deadlines, checklists. Being organized will help keep you sane. We used Google docs so everyone involved in certain parts could have access to what they needed. Coordination. No matter what your budget, you need a day of coordinator. I can be a professional. It can be a friend of a friend who is very organized and who wouldn’t have been invited to the wedding anyway. But you, the bride, do not need to be thinking about details the day of the wedding. And your mother or mother-in-law, or anyone already involved in the wedding shouldn’t have to either. If you’re in the Atlanta area or North Georgia, I highly recommend White Vine Weddings because they were amazing. Food. Obviously you want it to be good, but rarely do people remember the food. We hired a caterer and hadn’t even tasted the food but they had great reviews. There are numerous wedding websites now that have reviews of any company that does things wedding-related. Use them. In the end, there were a few things we would have changed about our catering experience, but it did not make or break our wedding. People ate, enjoyed the food, and the service was good. Check out Zest in Atlanta! Friends. If you’re like me, you had a number of friends get married before you. Ask them questions, ask for recommendations, and ask for help. I don’t think I asked for much help (though my friends may remember differently) but I did ask one friend in particular a lot of questions. She had gotten married in the same city about a year and a half before me. She had great recommendations and we ended up using the same DJ, who people still talk about today as being the best wedding DJ they had experienced. DJ Spontaneous will not disappoint! Decor. It can be simple or it can be elaborate, but make it what you want. It’s your day. If you have the budget, rent items so you don’t have to figure out what to do with them afterward. If you lucky enough to find a company that does multiple things, you can cut down on vendors. White Vine Weddings (read coordinator above) also did beautiful decor that can be customized just for your wedding! See photos below of signs and flowers that they did. Photo and Video. These are the things you will have from your wedding for the rest of your lives. Make it a planning and budget priority. Use reviews and recommendations. Every person I asked when my planning our wedding said they either regretting not have a videographer or that the videographer was the best thing they spent money on. We were lucky enough to have connections for both of these things. My friend did our photography and my husband’s coworker shot video. Then if you’re even luckier, like me, your husband can edit the video and you get a perfect, personalized reminder of your special day. In the end, you want your wedding day to be exactly what you want and not what other people want (except maybe ask your fiancé’s opinion occasionally…I guess it is his day too). Make it perfect for you and enjoy the process! Categories: Thrilling Thursday | Tags: catering, coordination, dj spontaneous, marriage, photographer, planning, videographer, wedding, white vine weddings, zest catering | Permalink. Pay attention because this is the most DIY you will ever get out of me. 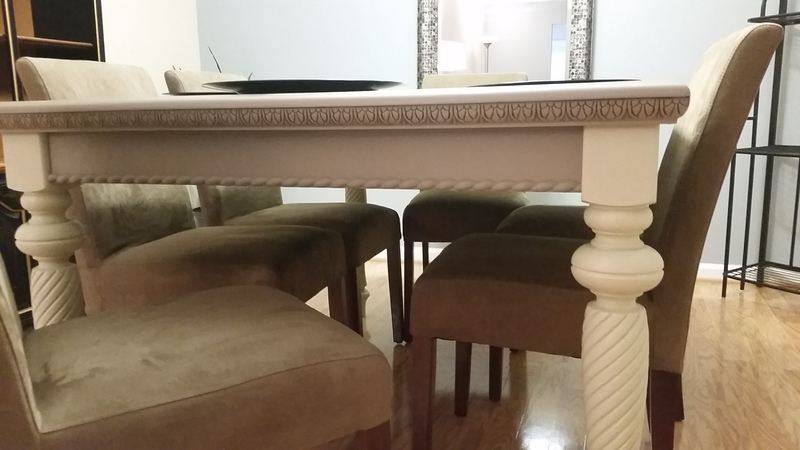 I bought a condo about a month ago and have some great pieces of furniture but wanted to update some of it. 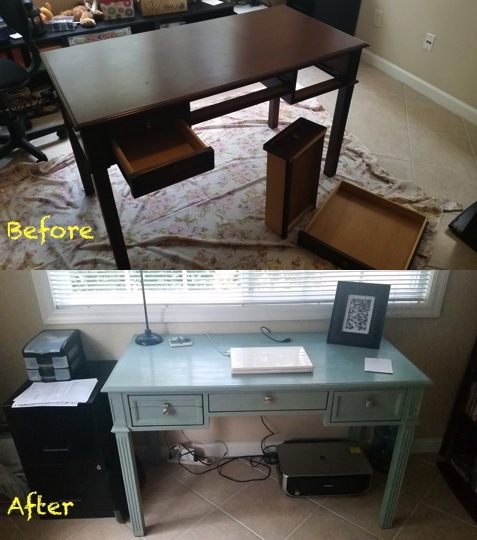 My brother and sister-in-law recently tried out Annie Sloan Chalk Paint – they loved it and it looked great so I decided to try it out. 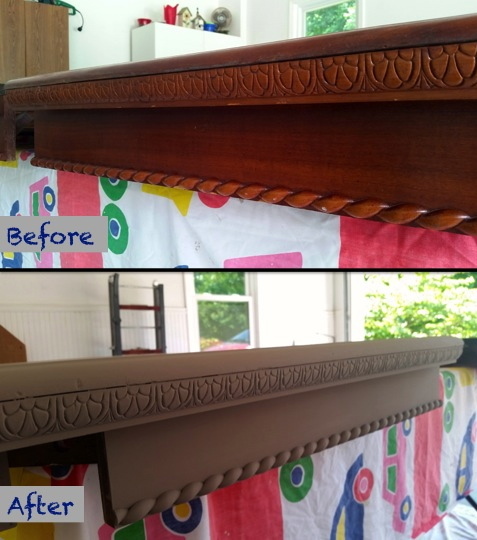 No sanding, no priming – sounds good to me! They had some leftover Duck Egg Blue color (it doesn’t take much of this to paint anything) which is the color I wanted for my desk anyway, so my mom tested it first on my wine rack when I was out of town one weekend. Easy! So we plowed on forward. I apologize for the lack of great pictures for the desk – I forgot until we had taken it apart already. But we took it apart, painted it all (2 coats), then waxed it all with the clear wax, and bought new hardware! The wax acts as a sealer though I may go back and use a different sealer on the top since my hot computer sits on top of it. I LOVE how it turned out though. Tip #1: we painted inside and I have a dog – somehow little dog hairs kept getting into the paint and wax – so beware. We did my second piece at my parent’s house in the garage and did not have any issues with stuff getting into the paint or wax. Tip #2: we used a old t-shirt to apply the wax instead of the official Annie Sloan wax brush. 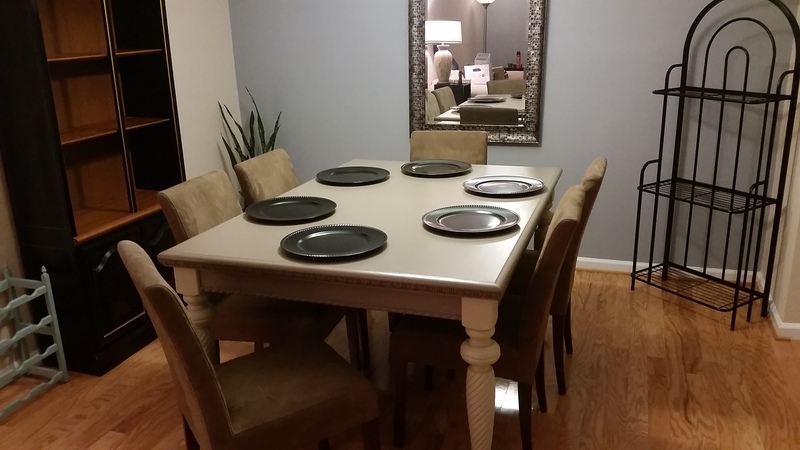 Next up: dining room table. I bought this table many years ago off Craigslist. It didn’t fit in my previous apartment, so it’s been in my parent’s basement – hence the no ‘before’ picture of it together – but here are all the pieces. After much debate and help from a wonderful woman at Chalk It Up, I decided to go with two colors: Coco for the top and Country Grey for the legs, with dark wax for the detail (getting adventurous). Then she recommended a different sealer for the top since it’s something that will be used a lot. Now none of this would have happened without my mother’s help. She’s a little more DIY-ly inclined than I am. 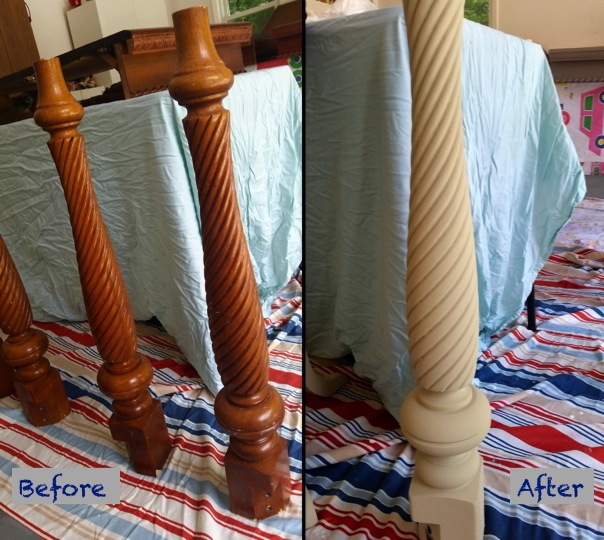 So we took a good part of a weekend and got to work – 2 coats of paint on each piece, letting the paint dry overnight, then my mom clear waxed the legs and we decided to just leave those as they were (no dark wax). Next we had to figure out a technique for the dark wax. You want to clear wax first, so we did that and let it sit for a couple hours. Then trial and error ensued. 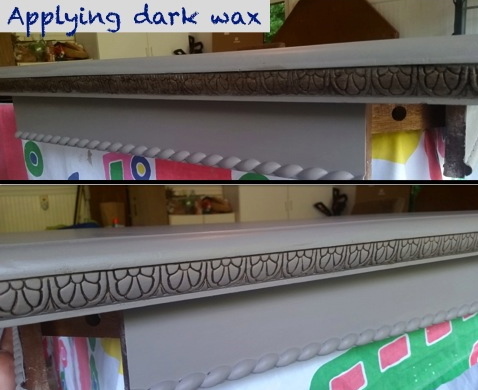 The idea is for the dark wax to fill in the detail, then you clear wax away the excess. 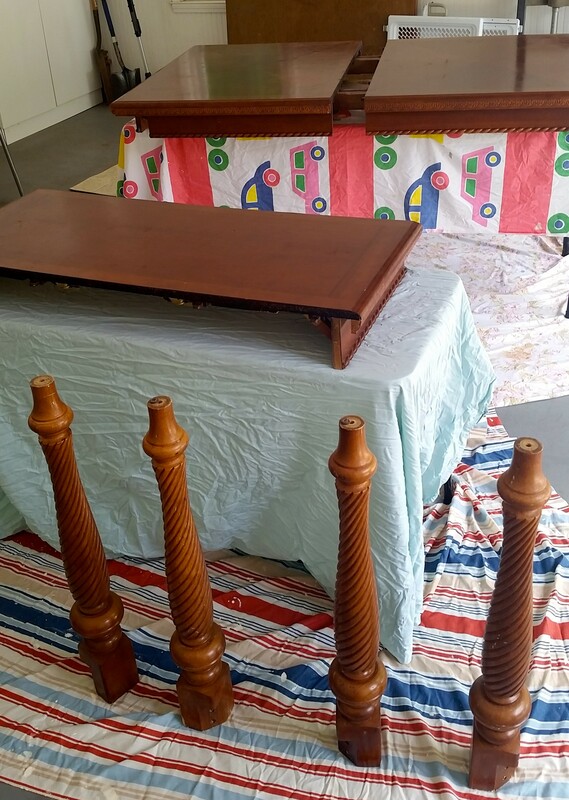 What worked for us: my mom used a small paint brush (like large art brush size) to put the dark wax on the detail edge, then I came behind with the clear wax and old t-shirt to remove the excess. It actually worked pretty well and I was really happy with how it turned out! Lastly we sealed the top with General Finishes topcoat (pictured above) using a foam brush (3 coats). Lots of coats of things overall which is why it was no quick project. Then we got it to my condo and put it together. I LOVE it! We may still paint the legs of my chairs but that’s a project for another weekend. Any other chalk paint experiences out there? Any additional tips? Any questions that I may or may not be able to answer? Tip #5: don’t use wax on a surface that will be used a lot for different purposes (i.e. hot dishes, sweating glasses, potential spills, etc). 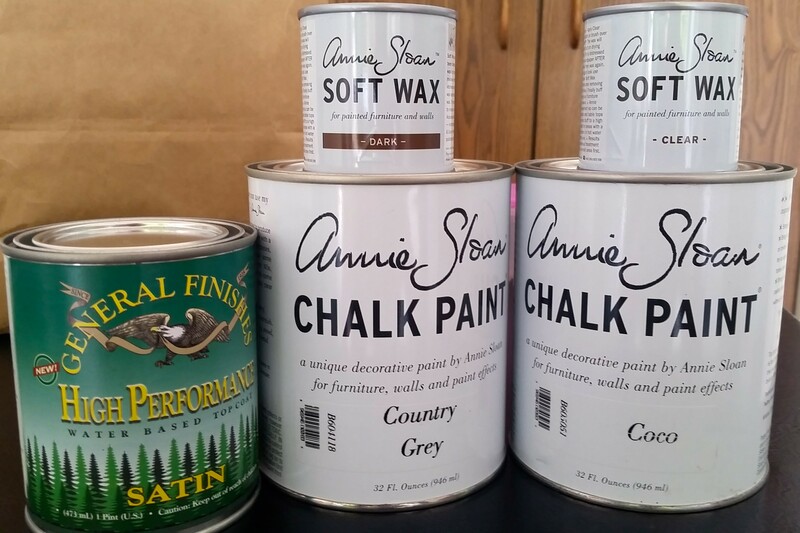 Categories: Thrilling Thursday | Tags: Annie Sloan, chalk paint, DIY, furniture, painting | Permalink. I am all about trying new things, especially when it comes to food, and especially if it is simple. I’m sure you’ve seen many different meal delivery programs – from the actual meal being delivered or the ingredients for you to cook yourself – but I’ve never tried one. My coworker, however, had tried and recommended Plated, and they have a great referral program, so I gave it a shot! You pick the day you want it delivered, then it gives you 9 meal options to choose from. Each meal feeds 2 people and you pick 2 meals (or more). Or if you’re on your own, like me, you get 4 meals out of it! The description tells you what ingredients are included and what you should have yourself (simple things like olive oil, salt, pepper). And each meal is marked by difficulty, so you can keep it easy or challenge yourself! And then it arrives!! In a cool insulated box with ice packs with everything you need! Everything is even measured out (except for those basics). I thought the difficulty level was appropriate and both meals were delicious. Interested?? Give it a try! Have questions? Ask away! Want a referral code (2 plates free)? Just let me know! If you are doing Whole30, you may want to wait to try Plated. If you are doing paleo, it’s probably doable. If you have an allergy, it’s probably doable. You can select, in your food profile, certain ingredients to leave out! It will automatically enroll you in the subscription, but you don’t pay anything for that up front and it will remind you before your card is charged so you can unsubscribe and not be charged. Categories: Thrilling Thursday | Tags: cooking, food, plated | Permalink.